Can someone love anime while hating transforming mecha robots? Is there a world of Japanese animation beyond giant bubble-filled eyes and predictable plots? 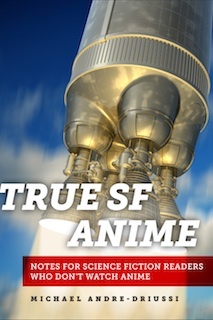 In this book of essays, Michael Andre-Driussi explores dozens of rare gems of anime, all built in the "true SF" tradition: movies and TV shows with real stories, real characters, and real explorations of the technological possibilities of the future. The works covered include Paprika, Planetes, Wings of Honneamise, The Melancholy of Haruhi Suzumiya, and more. Most of the essays in this short e-book are based on articles previously published in The New York Review of Science Fiction and The Internet Review of Science Fiction; three of the essays are original.